The SIGNA Seed Exchange is a major benefit of membership. It is also the main fund raiser for SIGNA. The proceeds go toward the publication of our SIGNA Bulletin and help to sponsor collecting trips, special publications, and research grants. Greetings from the Seed Exchange Chair. Growing Iris from seed is a unique opportunity, a challenge,and the heart of SIGNA. This is the first year for the new Seed Exchange chairman. The seed list is the result or many people working together. The seed donors, counters, packers and many ‘behind the scenes’ helpers. Special mention of Dennis Kramb who makes the internet work for ordering and paying for seeds. This has made the operation immensely easier for all members, especially foreign members. Thanks guys to all involved. The SIGNA Seed Exchange is the heart of SIGNA. Growing iris from seed is a unique opportunity and challenge. Seed donations are reduced from last year, but still has a wide range of offers. Seed orders are filled in the order received. Seed can be ordered from this printed form in the SIGNA Newsletter or on-line at the SIGNA web site www.signa.org. The web site has late arrivals so please check for the most current updates including those that are SOLD OUT. Seeds are shipped in the early months of the year. Orders received after Mid-March will be filled from a reduced inventory by the Membership Chairman, Rodney Barton. Please refer to the web site if placing a late order. MEMBERS ONLY: Seeds are only available to members of SIGNA. Please share your SIGNA seed list with friends who are non-members. They may copy the order blank and send in their own order, but must include payment for one year's membership (even the basic price electronic membership) along with their seed order. We have included a place at the bottom of the order blank for new members to join and order at the same time. If you are already a member and wish to pay your dues, you may do that in one mailing with one check or by Pay Pal. We do not accept credit card payments. PRICE: The price of all seeds is unchanged at $1 per packet. There is a minimum of 4 seeds per packet (5 per packet of SIGNA Select). The cost of shipping continues to increase due to higher cost of postage. This has forced us to raise the charge for shipping. There is a flat $3 charge for each order to an address in the USA. Orders to all other countries including Canada must pay $7 per order. We regret the high cost to foreign members, but this charge is less than the actual costs to SIGNA. If ordering and paying on-line, there is an added $1 per Pay Pal transaction. If you send a check or cash DO NOT add the $1 Pay Pal charge. ORDERS: Seed orders are filled in the order received. Seed should be ordered on-line at the SIGNA web site or from the printed form in the SIGNA Newsletter. Please check for the most current updates at the web site before placing an order. Seed donors get priority in filling orders. Arilbreds are listed in Section I rather than V.
ABBREVIATIONS: Abbreviations following the name: HP means Hand Pollinated, OP means Open Pollinated, WC means Wild Collected, and ex. indicates that the seeds were originally from another specific source (such as a person, a seed exchange, wild location, named cultivar, or a garden). Seeds of named cultivars ARE NOT identical to their parents and should never be given that name in the garden. They are new seedlings. Colors are abbreviated using English names. AVAILABLE SEEDS: After each item in the seed list, you will find an abbreviation estimating the total number of seeds available. VF = Very Few Seeds (less than 25) available. These will sell out quickly. There may be as few as 1 packet of seed, but no more than six packets. If you place your order late, PLEASE do not order these items. FW = Few seeds (under 50) available. Be sure to check substitutes when ordering seeds marked VF or FW. Seeds in short supply may have as few as 4 seeds per packet and they will not be used as substitutes. AV = Available. This means that seeds are generally available and most orders will be filled. Packets may have between 5 and 10 seeds. AB = Abundant. Seeds are in abundant supply, are less likely to sell out and will have more generous number of seeds per packets. If you want items with more seeds per packet, order items in abundant supply. We DO NOT send more than one packet per listing per order. We do accept 2nd and 3rd orders, but these are filled in the order received to give all orders more equal chances. Most seed packets will have 10 or more seeds each. Please list substitutes on all orders. 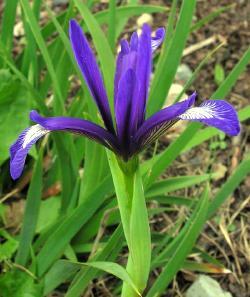 ALL SEEDS: Seeds of any Iris species or member of the Family Iridaceae are welcome. Even the most common and abundant species are welcome and appreciated. Hand-pollinated, wild collected and uncommon species are especially sought after. All seeds are requested. There are multiple requests for each and every one of the donations. Be sure seeds are fully dry before packing. Please read about restricted seeds on the Ordering Seeds page. QUANTITY: 100 to 1000 seeds are ideal, but any number is welcome. Even if you only have one packet of seed to send, please do. They are greatly appreciated. Small paper envelopes are the preferred method for packaging seed. Please do not use film canisters, small boxes, etc. as they are difficult to organize. LABELING: Mark each envelope clearly and legibly with the correct name. If it is a named cultivar, please provide the species name or hybrid group to which it belongs. If it is from hand pollination, mark it HP; if it is wild collected, mark it WC and give the town, county, state, country and elevation if known; if it is from plants growing in your garden that were wild collected, write "ex." then give the above information; if it is grown from seed received from someone else or a seed exchange (SIGNA, BIS, NARGS), so indicate. Try to give a brief two to four word description, especially if there are any unique characteristics. Seeds with clear descriptions are always more popular. Be sure to include your name and address. PLEASE GIVE AN ESTIMATED SEED COUNT on every packet. HAND POLLINATED: PLEASE try to hand-pollinate the species in your garden specifically for the Seed Exchange, either by using two clones of the same species or by selfing. Hand pollination (HP) assures that a particular species will come true from seed. This is especially important for those species that readily cross with other species (e.g. bearded, aril, siberian, PCN, LA, spuria, etc.). This is the only way to preserve these true species! WILD COLLECTED: Many of us live near an area where irises grow wild. Wild collected seed (WC) is extremely popular and the best way to insure genetic diversity. If you know an area where irises grow wild, please make a trip to collect seed from as many plants as possible. 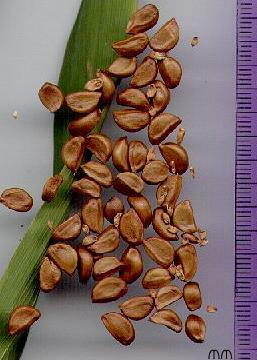 Even if a widespread species, we have many members who would like to grow seeds of your native iris. DATES: All seeds should be post marked no later than November 1. For later ripening seed please send a list and brief description of each by the above date, so they may be included. These late ripening seeds must be received no later than December 31. Seeds received after this may be used as extras or held over till next year. FEED BACK: Donating seeds in fun, but takes some effort. Our donors would appreciate your feed back on how their donated seeds performed. If they were misnamed let them and us know. Mostly show your appreciation by dropping a note and telling them your experience and thanks, too. FOREIGN DONORS: For all donors outside of the United States, please send seed to the seed chairmen at the above address and email in advance for the current regulations regarding import of seed into the US. Foreign donors should send seeds no later than October 15 to allow time for proper handling and postal inspections. We will provide detailed info on import and documentation to insure safe and legal transfer of seeds. LEGAL RESTRICTIONS Iris pseudacorus and some Moraea and Watsonia species are prohibited in parts of North America. Iris pseudacorus is a "noxious weed". Some states and provinces treat it like a non-ornamental weed where you must by law eradicate it on land you own: California, Montana, Washington, Alberta, British Columbia. Others treat it like an invasive ornamental where it is illegal to sell or propagate it: New York, Connecticut, Massachusetts, New Hampshire, Oregon, Vermont. In Connecticut it is specifically illegal to cultivate and existing plants must be destroyed. In Minnesota it is legal to buy and sell, but is a "regulated invasive" that is illegal to release into the wild. These laws should be assumed to include all cultivars, varieties and hybrids, and to ban trades and gifts as well as outright sale. Massachusetts clearly prohibits all of the above, while Connecticut allows hybrids unless specifically banned. Few other irids are currently considered noxious weeds. The US bans Moraea collina, M. flaccida, M. miniata, M. ochroleuca and M. pallida (all formerly Homeria spp.) without a permit. 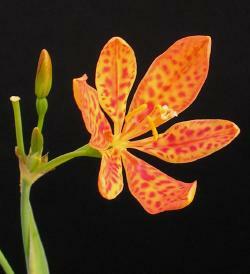 California prohibits Watsonia meriana v. bulbillifera. 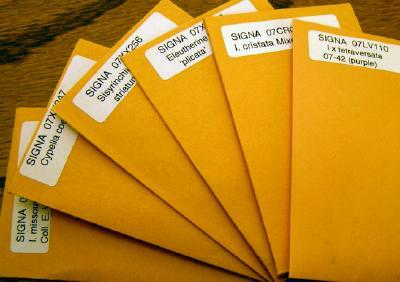 CURRENT SEED LIST will begin arriving in SIGNA members' mailboxes at the turn of the year. PAST SEEDS LIST are available online now. Please list substitutes as some selections may be reduced to 1 or 2 packets, and may not be available when you order. Refunds cannot be made. Generous extras will also be chosen from your list of substitutes. ORDERING OPTIONS: You can order here on this web site and pay securely on line via PayPal. This option requires an additional $1 surcharge for the PayPal services. Or you can order on line and pay by a check drawn on any American bank in US dollars. Make checks payable to SIGNA. Do not include the $1 PayPal charge. Foreign members can order on line using PayPal or send US currency, International Money Order, or a draft on a US bank. MONETARY DONATIONS: Sending an order to the Seed Ex is an opportunity to donate to support SIGNA. You may round up your check to the $5 or $10 mark or add any amount. Costs of all supplies and postage are constantly rising and your help is appreciated. SEED ENVELOPES: Seeds are shipped in 1-3/4 by 2-3/4 inch glassine envelopes with one end open for folding shut. Each envelope is sealed with an identification label. PAYPAL DETAILS: If you don't want to use the order form on this web site you can still pay via PayPal. Simply "send cash" to the appropriate email address shown above. Send your order list of primary choices and substitutes along with your mailing address and membership renewal to the appropriate postal address as well. Please add a $1 PayPal service charge. PAYMENT BY MAIL: Seed orders for the current year are processed by different people from the previous years seed lists. Please send your payment and order form to the appropriate postal address shown above. MEMBERSHIP: If you are not a current member of SIGNA and wish to order, please add membership dues together with your order. Past seeds may be purchased by non-members. REFUNDS: None. If we cannot fill your order and you have not made enough substitutes, the remaining amount will be considered a donation to SIGNA. Other donations appreciated. ADDRESS: Be sure to include your full name, address and email address, if available. Address labels not needed.